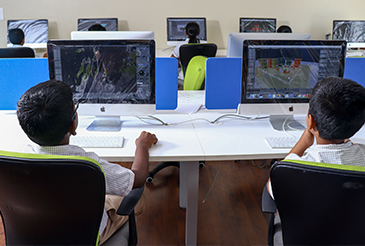 Mahatma, with over 30 years of experience in school education, designs its own curriculum that imparts knowledge and instils creativity in the young minds to drive them towards their ambition. The Academics is handled with finest teaching strategies to address the heterogeneous crowd with different learning desire and ability. 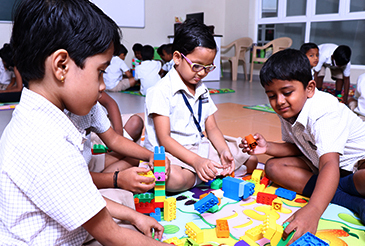 Our global campus, Mahatma Global Gateway, is conceptualized to further our quest to infuse internationalism in every aspect of a child’s learning environment. 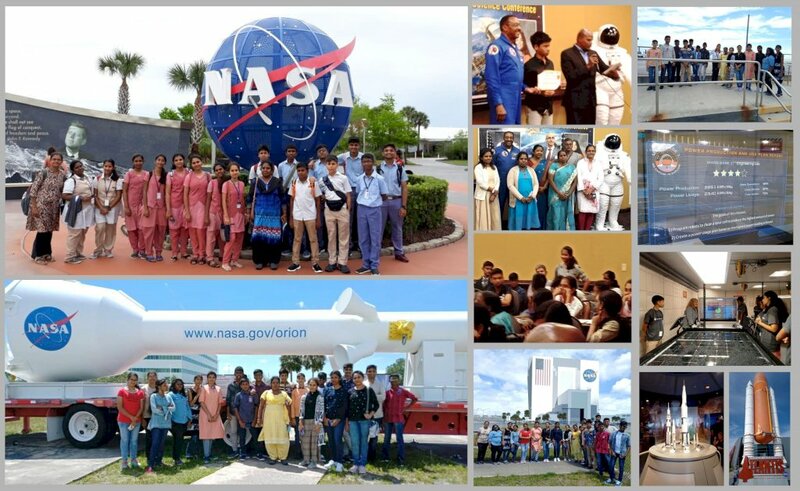 Kudos to the winners… Shrimadhan (Grade X) participated in National & International Level Space Science Essay Writing Competition in NASA, Kennedy Space Center, Florida USA conducted on April 15, 2019. He was awarded as a “Space Explorer”. In addition to this, Himanshu Choudary (Grade IX), Easitha (Grade IX) and Lisha Dharshini (Grade X) participated in the space camp training programme conducted by Mars Base-I unit, Kennedy Space Centre and got training certificate. To their surprise, they had a chance to interact with an astronaut Dr.Wincent Scott, who was a co-passenger with Kalpana Chawla. 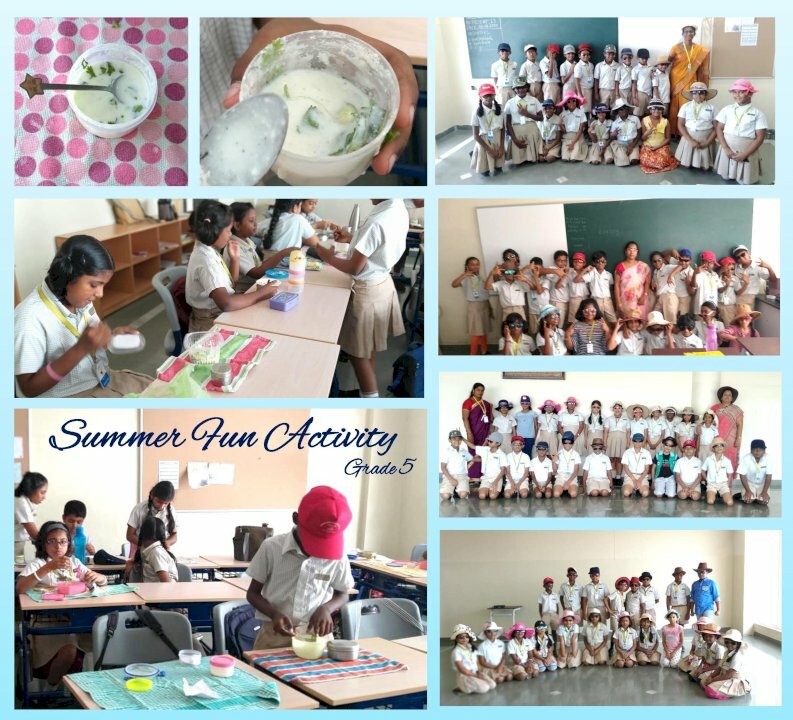 Summer Fun Activity Students were engaged in a fun filled activity to beat the heat of Summer. 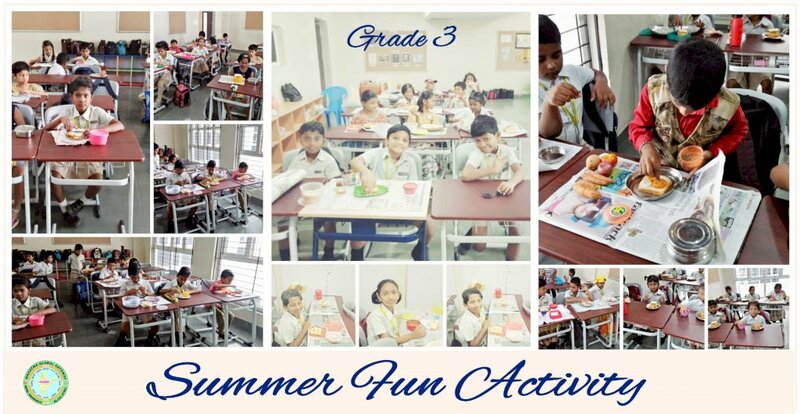 Summer Fun Activity : Students were engaged in a fun filled activity to beat the heat of Summer. Curriculum Orientation 2019-20 (Grade III to V) We extend our hearty thanks for attending the Parent Orientation scheduled on 5th April 2019. The Orientation took off with the prayer song and welcome address followed by the Guest Lecture from PAL Team - Personalised Adaptive Learning on “Importance of usage of Adaptive Educational app”. Curriculum Orientation 2019-20 (Grade VIII to X) We extend our hearty thanks for attending the Parent Orientation scheduled on 4th April 2019. 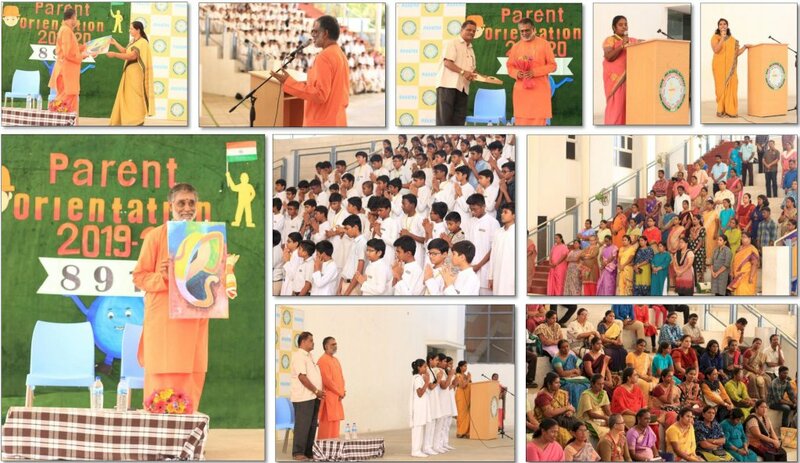 The Orientation took off with the prayer song and welcome address followed by the Guest Lecture of Swamiji on “Parenting”. 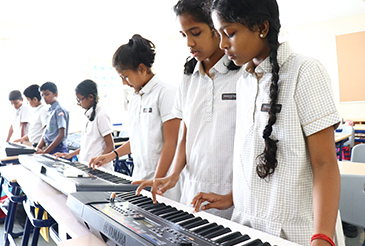 Curriculum Orientation 2019-20 (Grade VI & VII) We extend our hearty thanks for attending the Parent Orientation scheduled on 3rd April 2019. 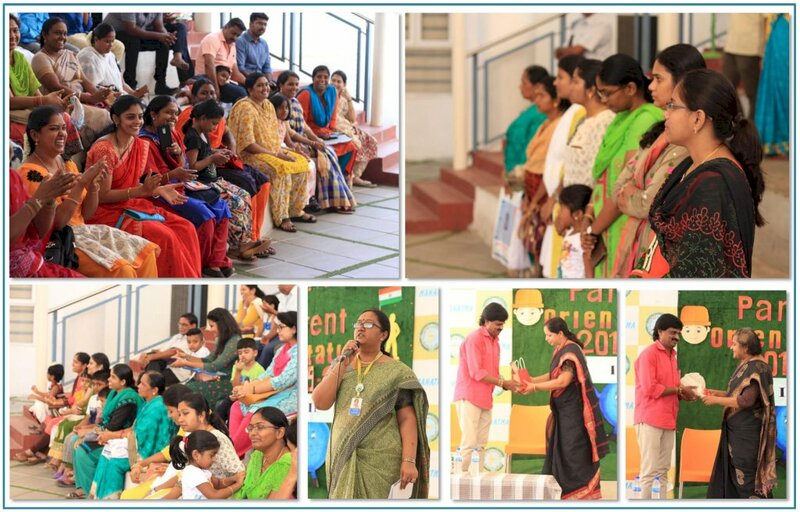 The Orientation took off with the prayer song and welcome address followed by the Guest Lecture of Dr. BAHESHREE DEVI MD., DPM, Consultant Psychiatrist focusing on the “Role of parenting”. Expo for Excellence - a conglomeration of all-things-art, Science projects and selling kiosks. 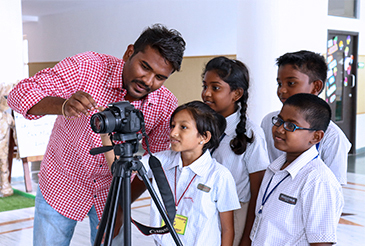 Art a harbinger to transform and empower young minds. 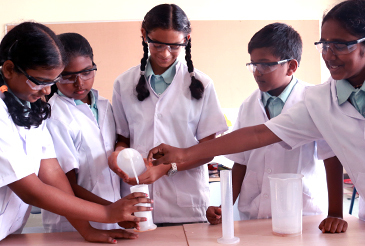 Science projects will let the children explore the modern science solutions to our pressing challenges of the eco system. Budding entrepreneurs hone their skills through these selling kiosks. Club Valediction 2018-2019 Students of III, IV & V unleashed their inner potential through the club activities throughout the year. 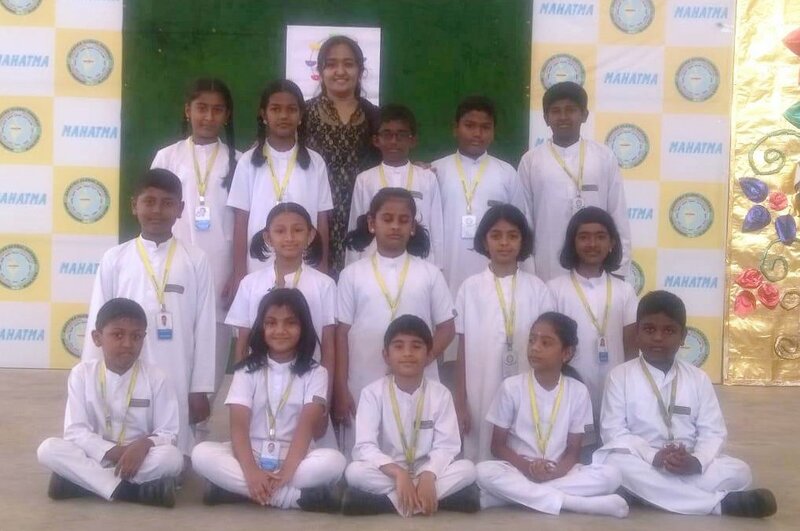 The chief guest of the show is Mrs. Narayani, Principal, Mahatma Cambridge International School, Madurai. Grade III, IV & V Students of the Month of January - awarded. Awards are: 1. I am responsible 2. I am an Initiator. 3. I love to help 4. I am a confident communicator 5. I am well behaved. Proud moment! Our school basketball students bagged the runner up title of junior NBA basketball tournament 2019. 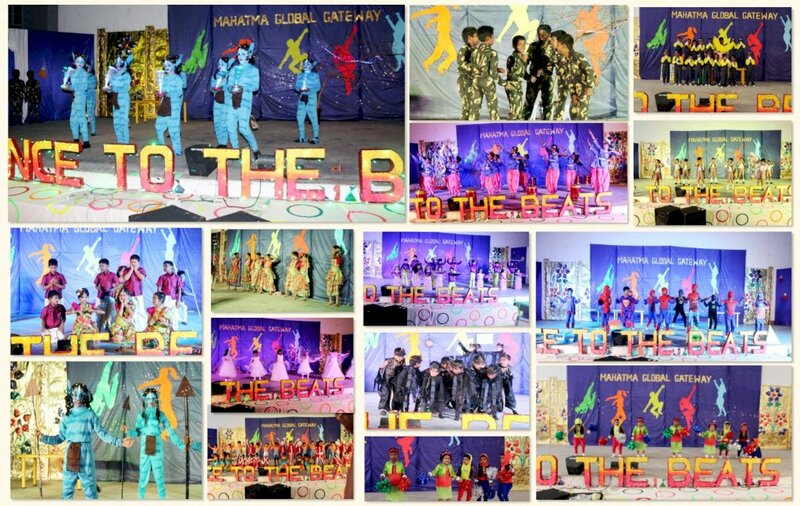 Students of Grade V brought the great epic Mahabharata live on the stage of MGG. 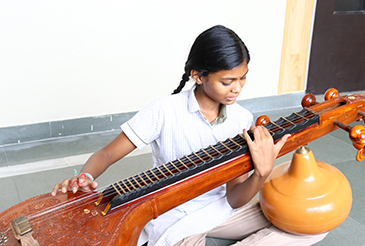 Every student understood the role they played and exhibited amazing confidence and shimmered in performance. It was an emotional moment when children hugged their parents and expressed gratitude. 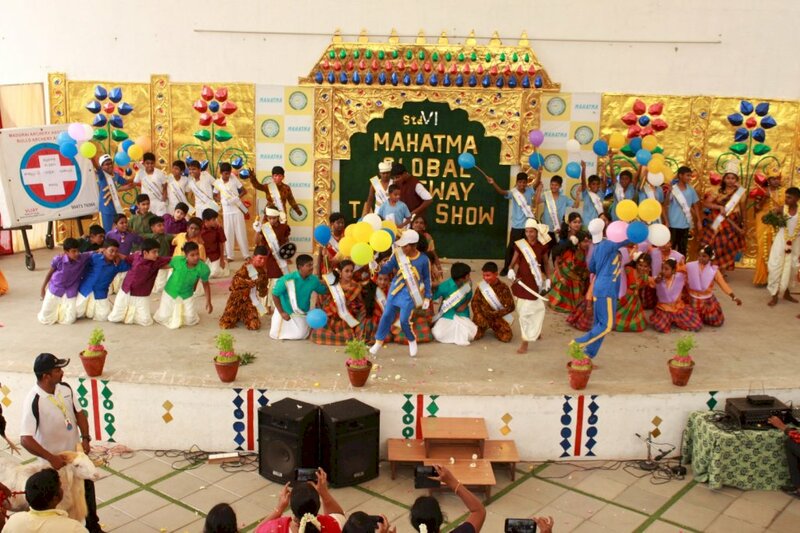 Students of Grade IV transformed the MGG stage into Vrindhavan. The story of the childhood of Lord Krishna and his naughtiness caught the attention of all children. The surprising moment is when the students tied a family bands and showered love to their parents. “Let’s plant a tree and make this world pollution free” was the basic concept behind the theme of our Grade VII Talent Show. Each and every event including mime, CC and the UNO talk was designed based on Clean and Green environment. As our initiative towards the awareness and reach out to each door step through our children, every parent was given a take home gift of a pack of seeds in a cloth bag. 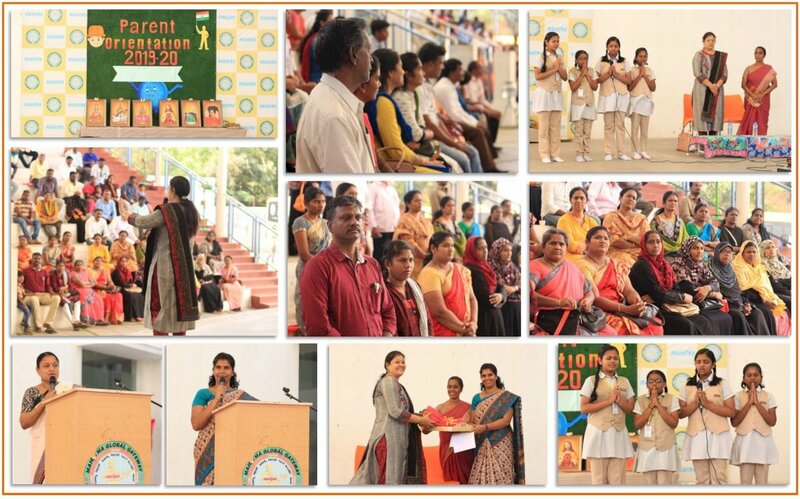 We thank all the parents for your wonderful support in making the event a grand success. 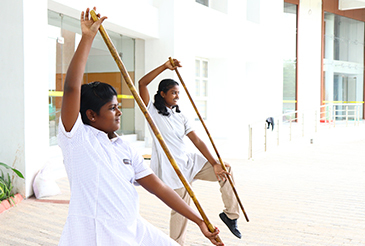 The importance of Tamil culture and its origin was well portrayed in grade VI Talent Show. 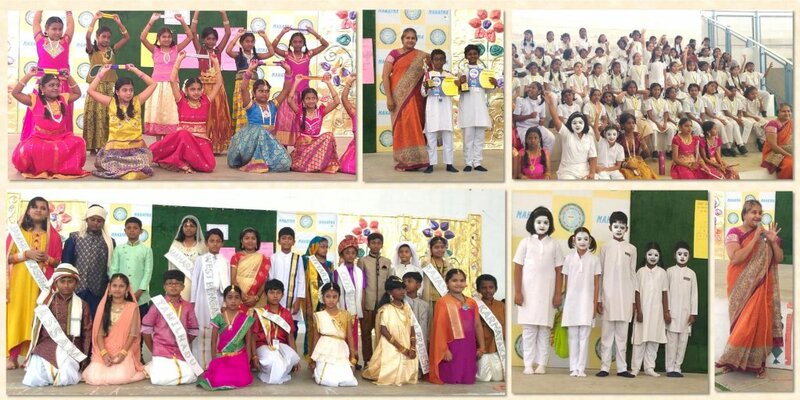 The various performances of our children created a special passion for our language and great love towards our culture. 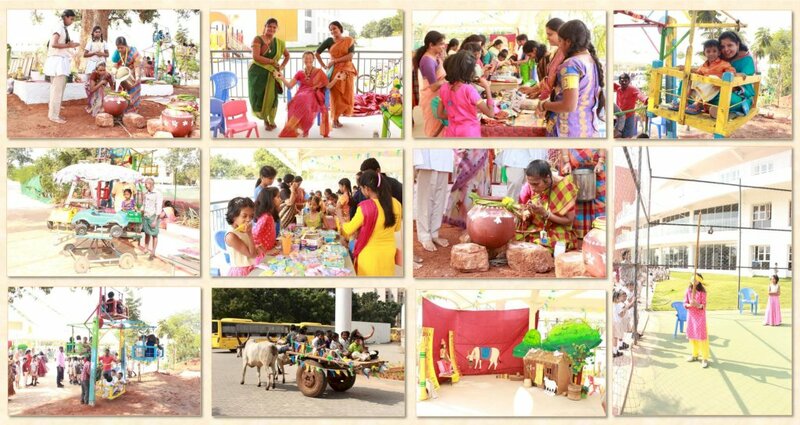 The flavour of cotton candy, seed pen and balloons filled the air with the fragrance of tamil culture. 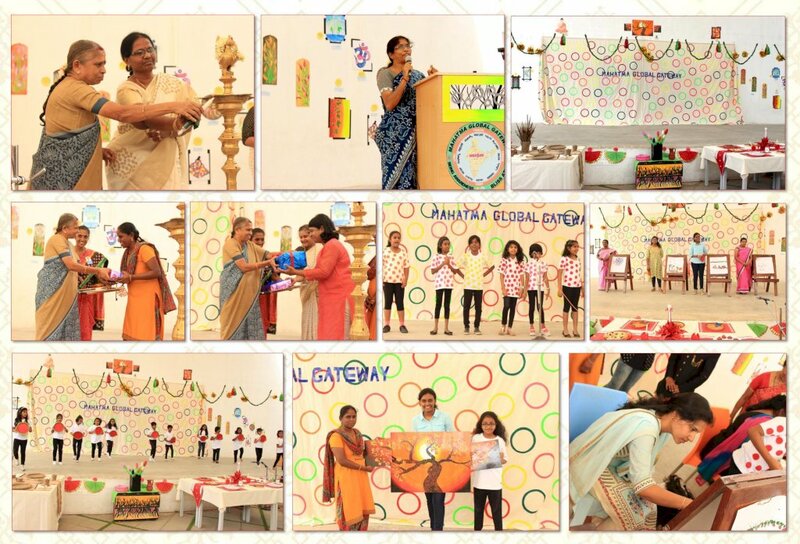 We thank all the parents for your wonderful support in making the event a grand success. 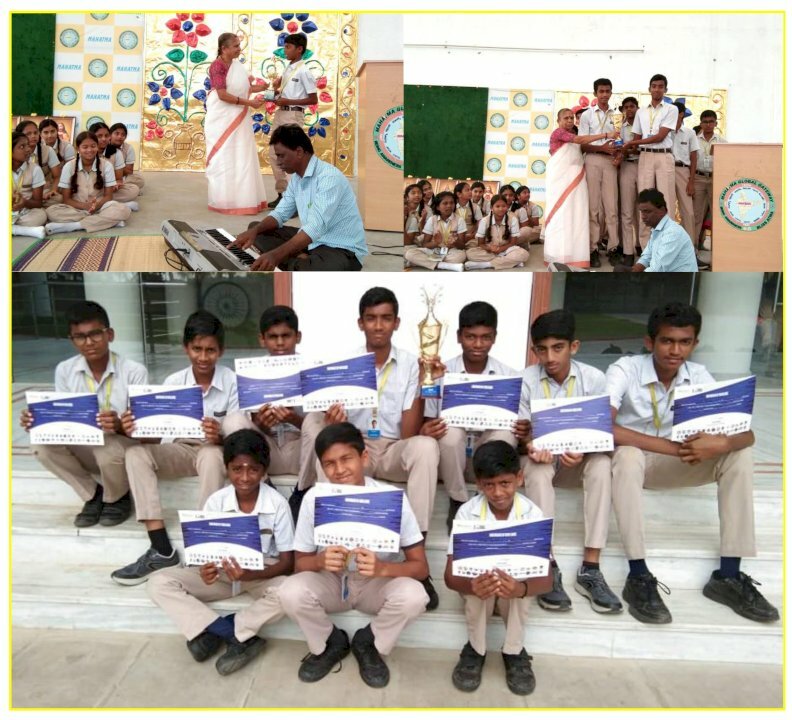 Kudos to the winners… Shrimadhan participated in National & International Level Space Science Essay Writing Competition in NASA, Kennedy Space Center, Florida USA conducted on April 15, 2019. He was awarded as a “Space Explorer”. In addition to this, Himanshu Choudary, Easitha and Lisha Dharshini participated in the space camp training programme conducted by Mars Base-I unit, Kennedy Space Centre and got training certificate. To their surprise, they had a chance to interact with an astronaut Dr.Wincent Scott, who was a co-passenger with Kalpana Chawla. We are proud to share the next achievement of Jovitha Sangai. 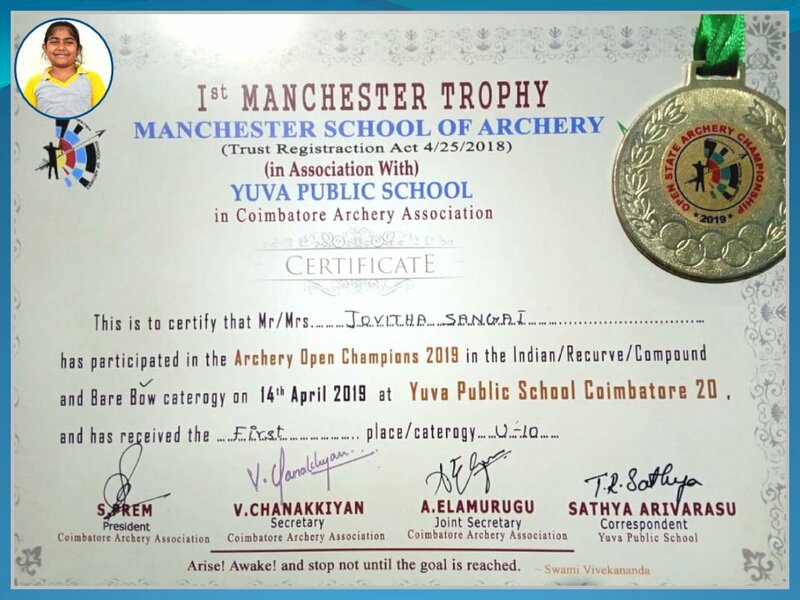 She has won the first place in the under 10 Manchester Trophy Archery competition organized by Yuva Public School in coimbatore. Hearty congratulations! 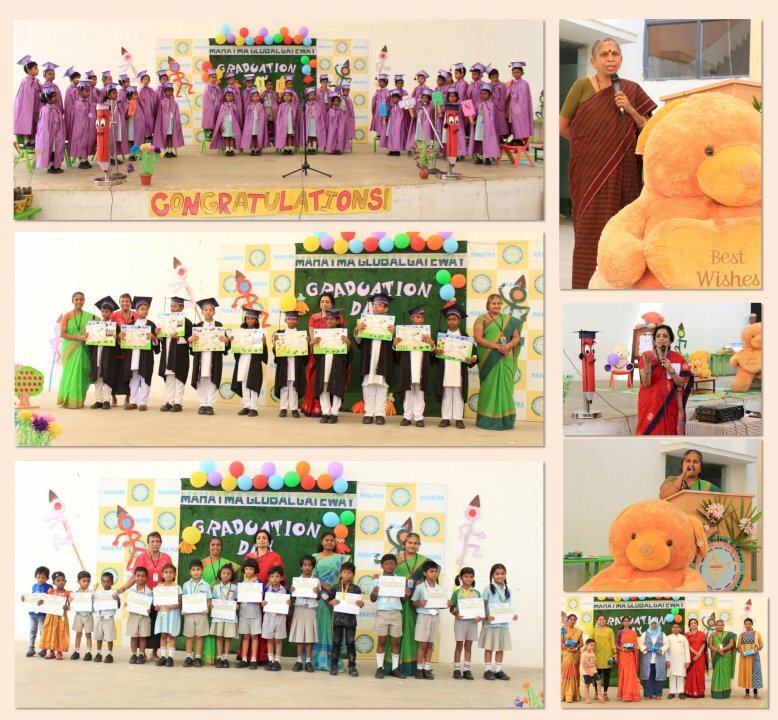 Our Reception & Grade V grandaunts successfully completed a course of study and were awarded on this memorable occasion. 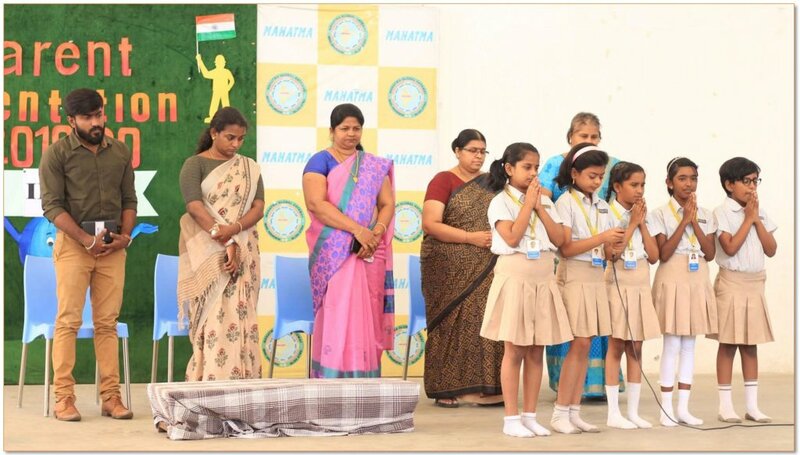 Mrs.Nandini Murali the Chief Guest presided over the ceremony. The presentations by the students were close to our heart as it acted as a thanks giving ceremony. 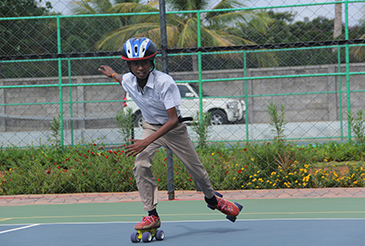 Our heartfelt gratitude to all the parents for their encouragement and support throughout the year. The Story Festival organized through BIBLIOS - the Book Lovers team was an excellent take away for the vacation for both the kids and teachers. 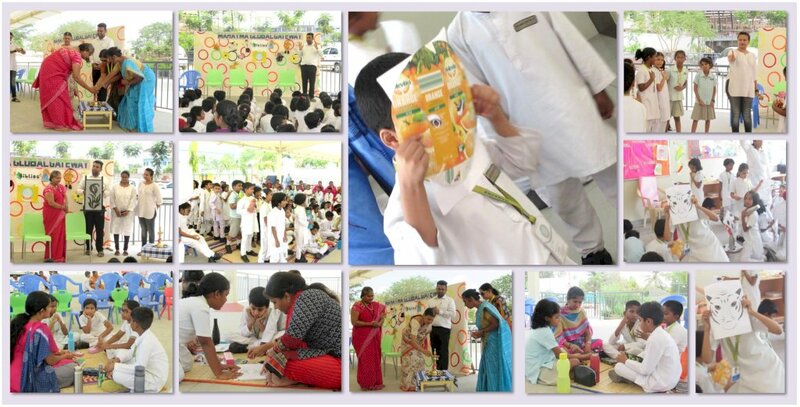 The story relay, the mask making and the story sessions engaged and entertained the students throughout the day.
" 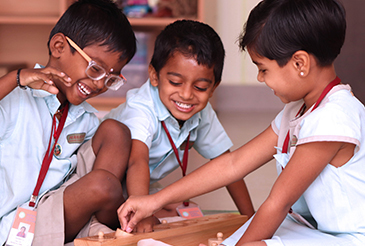 Nothing beats an exciting hands on experience to deepen learning. The magic of a field trip isn't just the subject. 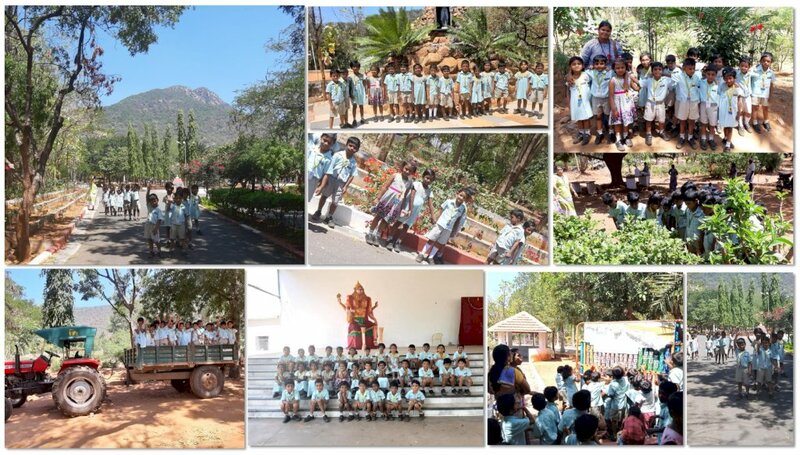 It's the break in routine and adventure that opens up children's minds to new things" our Pre-nursery, Nursery and Reception learners were taken to field trip to Algarkovil to enhance their learning. 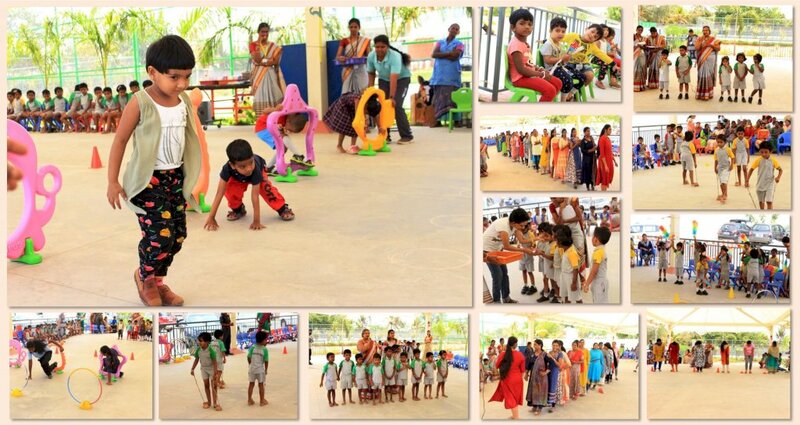 yoga session by Mrs. Mithra made the children feel relaxed and stay with peace of mind. We have no words to express the fun they had on 'moo'ing with the cows, quacking with geese and learning ' Tall-short ' from the trees and plants. We were amazed to see our young learners appreciate and enjoy beauty of nature. The Dance to the Beats' - Footloose presentation was the highlight of this month. Children danced to the vibrant beats for the rocking music which made the audience to dance along. What an energetic evening! Children, teachers and parents danced to the finale letting out stress and letting in joy. The stage decoration, the costumes and props and the hardship of the masters and teachers were evident and brought in a glorious dance night. Hats off to the students for bringing success in each of their performances. 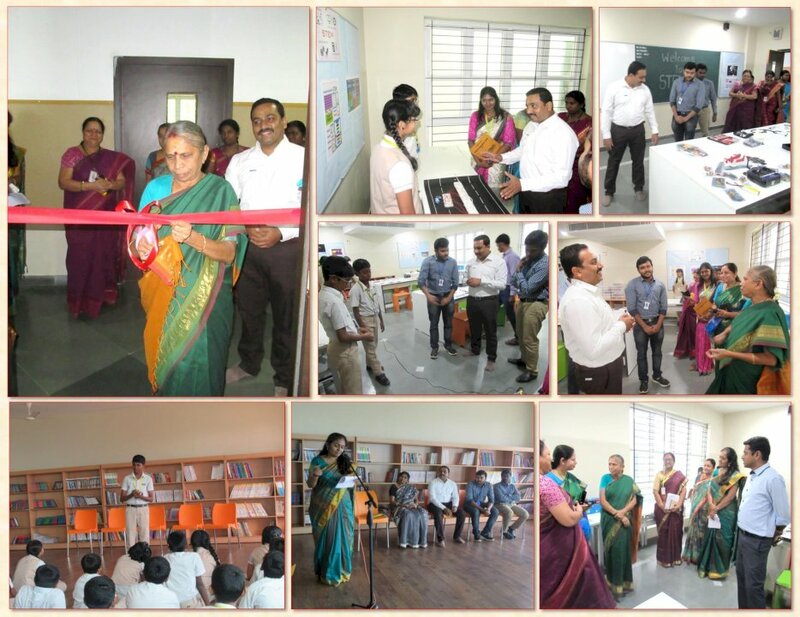 STEM Lab Inauguration: The much awaited STEM lab is inaugurated with all bells and whistles at an auspicious time in the presence of our Senior Principal Mrs.Premalatha Madam and Deputy General Manager of HCL-Mr.Prakash Raman. The joinery of STEM Lab exploration began with the students of Grade VII presenting their projects to the guests. 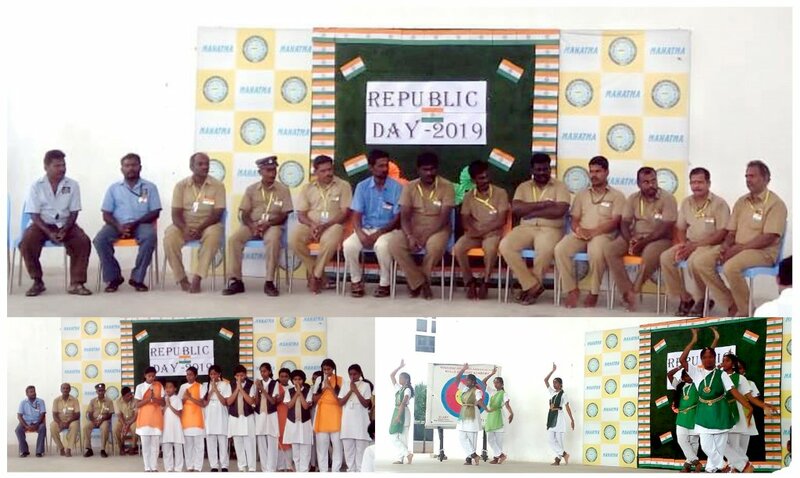 70th Republic day was celebrated in our school campus. The tricolor flag was hoisted by our transport department (Drivers and conductors). 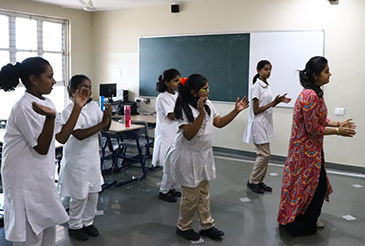 Children sang patriotic songs, a classical dance was staged by Grade IX students on freedom. A discussion on Republic Vs Independence day was debated by the teachers. Finally sweets were distributed to the parents & students. Grade 5 and 6 conducted an exclusive Math Expo on 21st January, 2019. 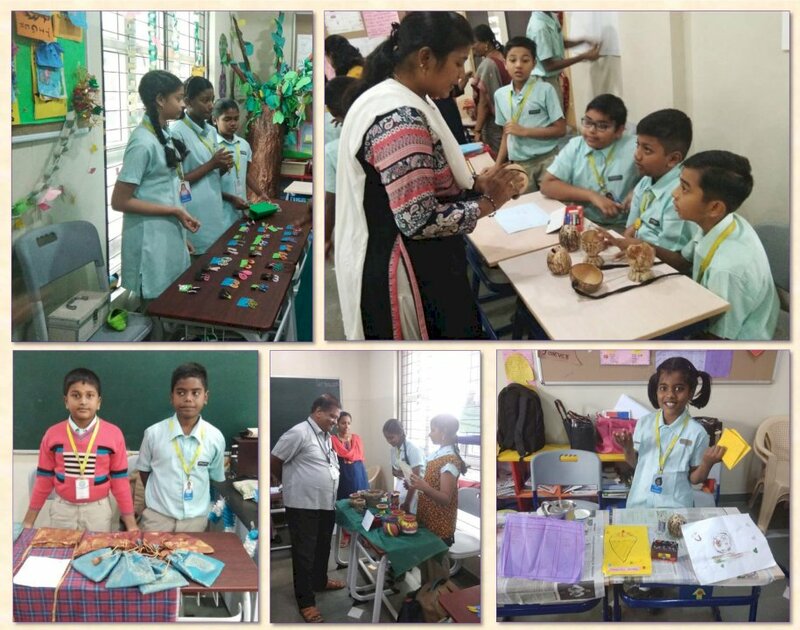 This combo pack was filled with quilling jewellery, handmade bags, handicrafts, homemade chocolates and juice stalls highlighting the logical and artistic capabilities of all learners. Mathematical and proportional explanations on the concepts of’ percentages’ by students to all their shoppers was a learning experience to both students and teachers. A special thanks to all the parents for their support and encouragement. Pongal is a festival to thank the almighty for the overflowing harvest. 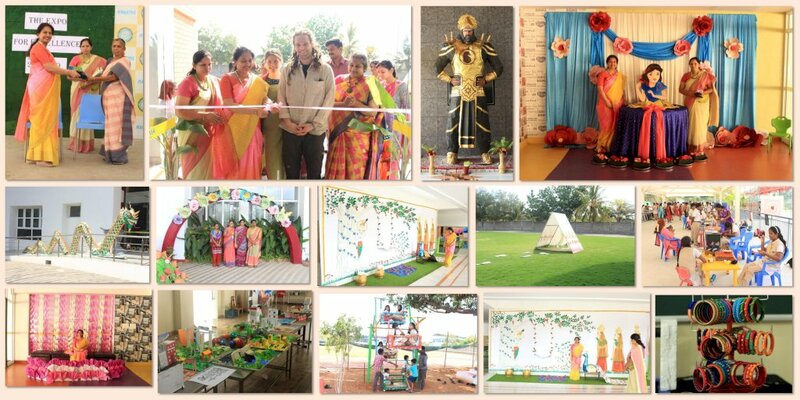 The 'Mann Vaasanai' Pongal carnival at Mahatma Global Gateway has given overflowing joy and happiness to all of us. The fun and games, the folk marathon, the jolly rattinam rides and the Bullock cart ride were the highlights of the carnival. Experiencing a village fair inside an international campus was the objective of this feat. We are thankful to all who supported in giving the best to the kids. Hope it was a memorable day for all. Have a happy and prosperous Pongal! 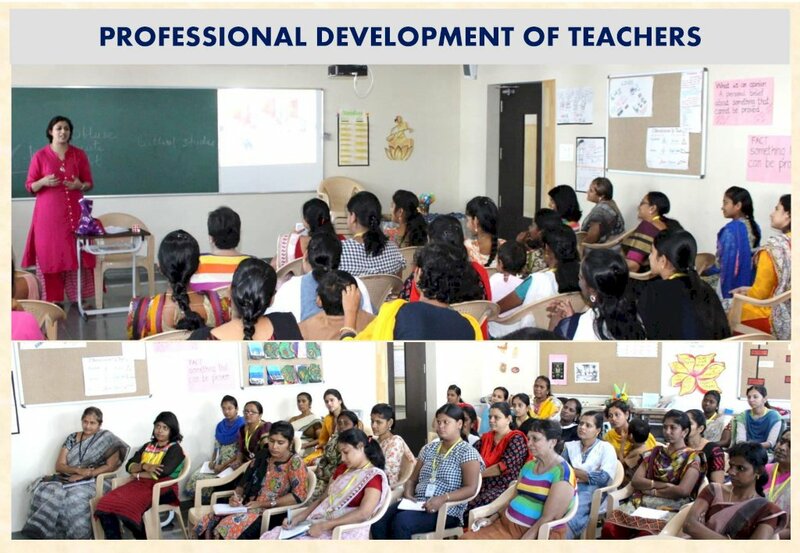 PROFESSIONAL DEVELOPMENT OF TEACHERS (Saturday- 05/01/2019) The first Saturday of the year unleashed an hour of Workshop for Teachers by Mrs. Rini Mathew. The session encapsulated an Introduction on the necessity to CORRELATE and CONNECT through facilitated teaching. Language is at its best when exhibited through an understanding of Human Psychology and the Workshop highlighted the importance of a rapport between one’s students and also with colleagues. Teachers reciprocated with positive feedbacks on the day’s experience and also recalled on the major concerns from the previous session. 'What could a dot on a paper do' was the question each of us had when we started preparing for the dot art in school this month. It took us to extreme happiness when the completed work was displayed and appreciated by all. If one has visited our Dot Art Fiesta, they would, for sure know the creative, cooperative and hard work put in by our students and teachers. Hats off to their teamwork! We just did cotton swab dots, pencil back dots and dots using everything which was round, but the eye capturing colours and perfect work has brought in the best fiesta ever. Thanks to parents for attending & participating in the stage programs and supporting us in the sale of art works which will be utilised for charity. Christmas is here and near. 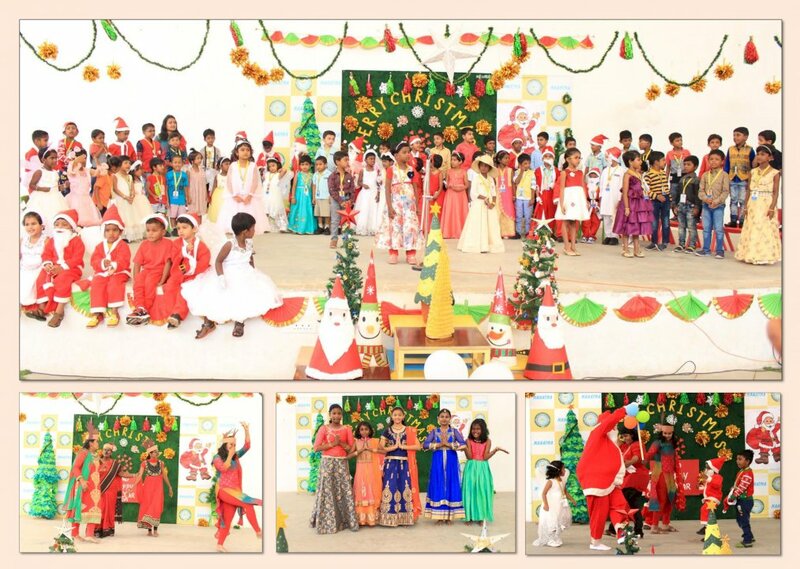 Number of Angels and tiny Santa’s filled the place when kids sang X-mas songs, delivered a short message on 'Who is Santa?' and enacted a short skit. There, entered our most wanted Santa, dashing through our kids. The place was filled with Jingle Bell songs, claps and laughter. What a lot of fun each one had. Teacher’s rain deer dance was full of energy and brought out a moral on inclusiveness which bagged the children’s cheers. Children’s day competition prize winners were awarded .As long as we know in our hearts, what Christmas ought to be... Christmas is.. Merry Christmas and a Happy New Year! My school is my dream school. Yes, my school gives me the exposure to bring my dreams true. Our school helps us to be a better person while stepping into the global pedagogy. Our school is always generous when it comes to helping the society. I am confident to voice out anywhere. That courage is given by my school. Our school has given us a lot of exposure to achieve so much in this competitive world through various workshops and trainings. My dream school filled with fantasies has matched its meaning when I entered Mahatma as a student. I am a fan of my school and a lover of nature as my school receives me with a green clean environment and smiling faces of my teachers.